Credentials: Jill Sigal is vice president of US government policy at Conservation International and also serves as chief of staff to CI's chairman and CEO, Peter Seligmann. As the assistant secretary of energy for congressional and intergovernmental affairs during the George W. Bush administration, she led the effort to pass the Energy Policy Act of 2005. Behind the story: "For my entire life, I have loved being surrounded by nature—hiking, rock climbing, biking. In nature, I find a sense of peace that I do not find in the fast-paced world we live in. I was motivated to write this piece ["Nature in the Eye of the Storm," page 100] to help raise awareness of the importance of nature in our daily lives and to inspire people to get involved and take action to sustain nature for generations to come." Proudest career moment: "Serving my country during my tenure as a presidential appointee at the US Department of Energy." Motivation: "What motivates me to work in the conservation field and what inspires me is one and the same—my son, Harrison. I have a choice: I can sit by and do nothing, or I can take action and do my small part to help ensure that nature continues to provide essential services to future generations." 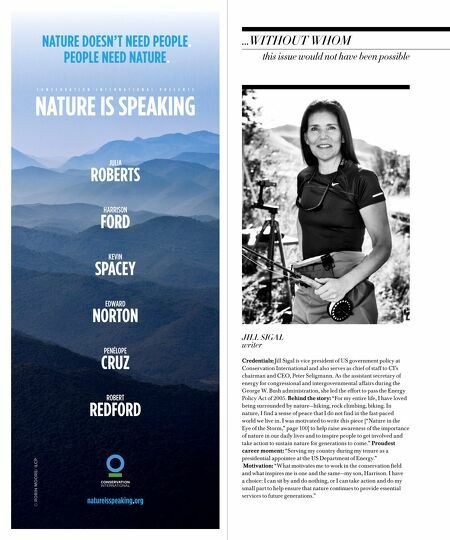 JILL SIGAL writer ...wIthout whom this issue would not have been possible JULIA roBerts HArrIson ford kevIn spacey edwArd norton penéLope cruz robert redford nature is speaking c o n s e r v A t I o n I n t e r n A t I o n A L p r e s e n t s natureisspeaking.org nature doesn't need people. people need nature.